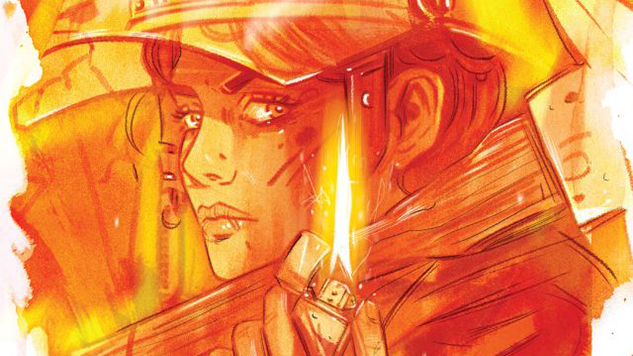 SLASH & BURN Collected Edition Review | Warped Factor - Words in the Key of Geek. 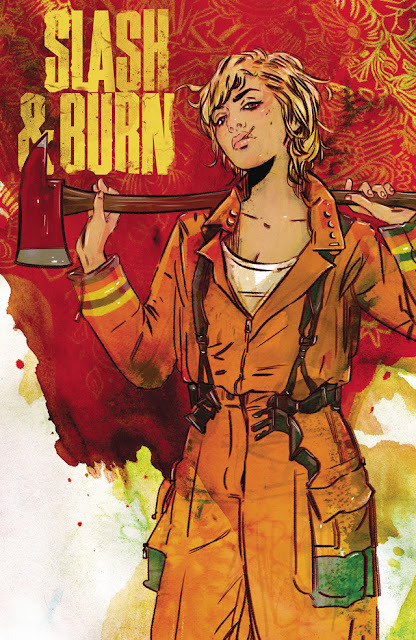 Gail Williams checks out the recent trade paperback release of Slash & Burn. North Dakota, outside a burning lock up Rosheen, in full fire-fighting gear, is announcing to the reader that she’s a murderer. Then she starts talking about bachelors and what they are like. 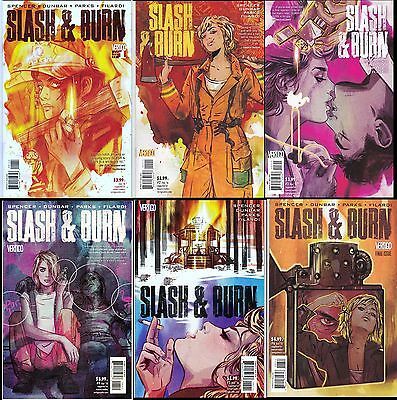 For a moment when I first started reading Slash & Burn I thought that the words and the pictures were disassociated, but quickly as a reader (once I’d got my brain in gear) I realised that the bachelors Rosheen murders are, in fact, the fires. Fire is something that Rosheen most definitely has an affinity for. She must have a nose like a gas chromatograph, the forensic diagnosis she can give for each fire just by sniffing it. Enter Detective Bill Morrow. Not so much designer stubble as just in need of a good shave. Still he’s good eye candy and gets more and more interesting at the volume goes on. This fire’s an easy one to solve, the burning pot explains the munchies, but does it explain Morrow’s dinner invitation? Not that the motive matters, seems Rosheen would rather spend time visiting a hurt colleague that on a hot date. Cue the family connections and flashbacks. Rosheen lost her mother to fire when she was a baby, her mother’s husband to fire when she was twelve and she was put in an orphanage - with a bunch of kids who liked starting fires. Are we sensing a theme here? There’s tension around the town as the fracking gets closer, but who cares that the ones who suffer are the Native Americans on the reservation? Apparently not corporate or government USA. So the realism creeps in. Another fire, another death. But this one hits closer to home. Not at Rosheen, but at an adult, whose identity unravels to be one of the kids from care who Rosheen grew up with. Then there’s another one gone. Five kids, they grew up together and apart, but will Rosheen be able to save any of them? Told in fantastic colour and detail for the modern times, interwoven with monochrome flashbacks, Slash & Burn is a real rollercoaster read. Rosheen is great. She’s properly drawn as a character, both for the actual drawing and the writing to bring through all the nuances of a rounded if damaged individual. She’s one of those characters that you want to read more of, but as I writer I know that what we see here is all that we should ever see of Rosheen. Anything more will taint and spoil the fullness of this well drawn together piece. In artistic terms this is a Mona Lisa - a great composition, perfect in its own totality and we don’t need to know what the smile means, or what happened to the eyebrows. Rosheen may have singed them off! Morrow turns out not to be quite the cardboard cut out he initially seems, nor is he the “bad man” he gets painted. Each of the kids has their own personality, their own way of being and they become the adults you could predict. The rhyme of the Matchstick Man is smart and scary and it’s used as a theme through the storytelling, like a lace that holds a corset - tight and constricting and utterly necessary. The orphanage shows it’s darker side, and as for what the kids do - understandable though forgivable will depend on the readers own sense of justice. Moral quandaries abound in this story and it might surprise you which side of the fence you come down on for some of them too. If did for me. Any comic that can really make you think as well as feel is a good one, and this does both. This volume is a collection of six comics that came out earlier in the year. I originally brought issues 1 to 4 together, but never purchased 5 and 6 because I didn’t get around to reading the first lot for too long. Big mistake! As once I had, I had to know how it ended, so I brought the collected volume. If that doesn’t tell you how much I loved this series, I don’t know what will. Well I suppose the scoring might. Definite five out of five for this one: fantastic writing, fantastic art. So good I’m going to read it again as I’m betting there are things in the background that I’ve missed - there always are. And it has a great last line. “My name’s Rose of Fire and I’m a pyromaniac.” Well my name is Gail and I confess; I’m a fan of this pyromaniac.